The bulk of non-commercial vacuums manufactured today are bagless, however there are still a large number of bagged vacuums on the market (this is especially true with canister vacuum cleaners). The question of which approach is better - bagged or bagless - abounds on forums and blogs. However there is really no correct answer and it comes down to consumer preference. Some people prefer a bagless machine because they do not wish to buy and throw away bags. Others like the cleanliness of bags which can be removed, disposed of and replaced. 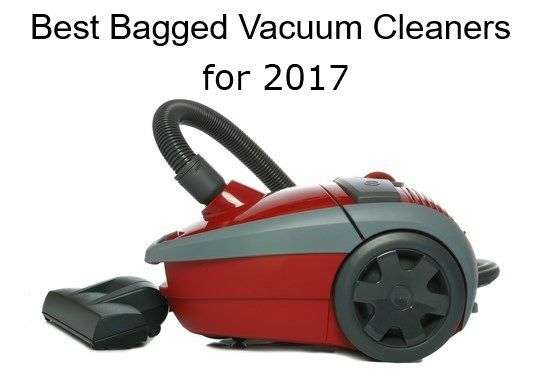 We have reviewed many bagged and bagless machines over the last 10 years, and following is our list of the best bagged vacuums. The Miele Complete C3 Soft Carpet is our number one choice for Best Bagged Vacuum in 2017. This is a great machine for people with bare floors, all levels of carpet, and even pets. Highly rated by consumers: There are very few negative comments about this vacuum and the consumer ratings - from a host of sources - are consistently over 90%. Packed with features: Comes with 2 cleaner heads, a motor-driven brushroll in the electrobrush cleaner head, multiple height settings, a bag change indicator, 3 tools, a 36 foot cleaning reach, a crush proof hose, a stainless steel telescopic wand, caster wheels with shock absorbers, a thermal cut out switch, a wrap around bumper, and more. Read more about this vacuum in our Miele Soft Carpet review. 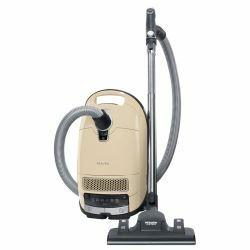 This is a great vacuum for the pet owner who doesn’t want to compromise on vacuum cleaner quality or features. The Cat & Dog is designed for households with pets and, as the name suggests, it excels at removing cat and dog hair. The Cat & Dog has received top notch consumer ratings and is a well-built, quality canister vacuum cleaner. Quite a few consumers also find it an attractive and stylish machine. 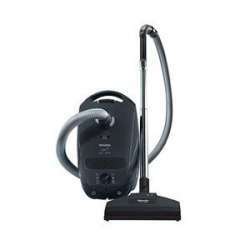 It is a bagged vacuum that produces powerful suction and is made in Germany. In addition, both motor and casing carry a full 7-year warranty. 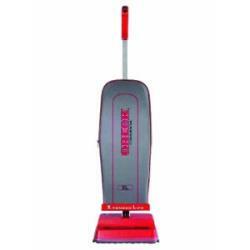 Two cleaner heads are provided – one for cleaning carpet and one for cleaning bare floors. The carpet cleaner head is motorized and is capable on low, medium and even deep pile carpet. It also comes with 4 tools: a dusting brush, an upholstery tool, a crevice tool and a handheld turbo brush. The turbo brush attachment does a good job at vacuuming up hair from stairs, upholstery and even vehicle interiors. Filtration on this unit is very good and it uses what Miele calls an Active AirClean exhaust filter. This specialized filter removes 99.95% of all particles larger than 0.5 microns in diameter and it contains active charcoal layers which trap and neutralize odors. This filter is combined with a completely sealed system to ensure only quality filtered and deoderized air is exhausted from the vacuum. Cleaning reach on the Cat & Dog is a full 36 feet and the vacuum also has 6 levels of suction which can be controlled via foot pedals on the canister body. The canister body is not too heavy at about 11 lbs. Read more about this vacuum in our Miele Cat & Dog review. The Complete C3 Alize is a fantastic choice for homes with predominantly bare floors (wood, tile, vinyl, etc). The Alize is less expensive than the Soft Carpet and the Cat & Dog but it still has a host of great features and is very highly rated by consumers. We updated our ratings for this machine in October 2017 and found an average owner rating of 93/100 which is excellent. The vacuum has a cleaning reach of 36 feet, a telescopic stainless steel wand, automatic power cord rewind, a deluxe comfort grip handle, an LED headlight, and 3 tools – dusting brush, upholstery tool, crevice tool. Foot switches on the canister body allow you to adjust to one of the six suction settings. The vacuum will also automatically adjust the strength of the suction as you transition for bare floors to carpet or vice-versa. This unit is known mostly for its proficiency on bare floors but it will also do area rugs and low pile carpet in a pinch. Filtration is very good and it comes standard with a HEPA level filter and a sealed system. Read more about this vacuum in our Miele Alize review. The Classic C1 Capri is a very good Miele canister vacuum that is more compact than the other 3 Miele machines in this list. It is best for homes with bare floors, area rugs and low pile carpet. The C1 Capri canister is smaller and more lightweight than the C3 units (canister weighs only about 9 lbs). 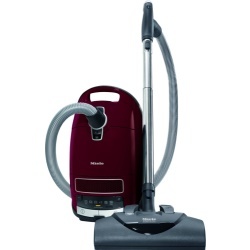 It comes with two cleaner heads – one for vacuuming bare floors and one for vacuuming carpet. The carpet cleaner head has a suction driven brushroll which allows it to be reasonably effective on low pile carpet but performance on anything deeper will suffer. Filtration is achieved by a Super AirClean filter which is not HEPA level. But should you want a HEPA filter you can uprade. 6 suction settings are provided and are controlled by a manual dial on the canister body. 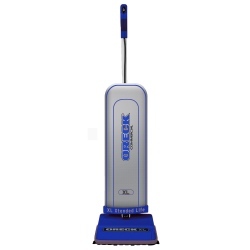 Cleaning reach is 29.5 feet and the power cord has the auto-rewind feature. Additional features include a bag full indicator, 360 degree turning wheels, three tools, a crush proof hose, a telescopic stainless steel wand, and a safety shutoff switch that automatically engages should the vacuum start to overheat. The Capri is also manufactured in Germany. Read more about this vacuum in our Miele Capri review. This upright vacuum cleaner is a very basic machine but it cleans large areas of carpet and bare floors very well. This is a commercial vacuum but it is also quite popular with home owners who use it for residential cleaning. The U2000R-1 is lightweight at under 10 lbs and it has a very lengthy 40 foot power cord. This vacuum has powerful suction but it is loud and has no tools or attachments. It is good bang for your buck and it can sometimes be found online for about $150. Read more about this vacuum in our Oreck U2000R-1 review. The 2100RHS is a reasonably priced, no frills, bagged upright vacuum. It is dubbed a commercial vacuum but is quite popular with folks for residential use. This machine is very lightweight at only 8.2 lbs and it is easy to lift and maneuver. It has a lengthy 35 foot power cord and a non-marring bumper but no hose. If you need a hose and attachments for overhead cleaning or doing stairs this may not be the right vacuum for you. It is also a little on the loud side. However, it has powerful suction and is good on both carpet and bare floors. In addition, the floor nozzle has automatic height adjustment. Read more about this vacuum in our Oreck 2100RHS review. This vacuum is also known as the Hoover Commercial Portapower. It is a compact, portable vacuum with a host of attachments. It is also very lightweight at only 8.3 lbs and it is worn over the shoulder via a shoulder strap. The CH30000 is a bagged machine and it has a 3-layer cloth bag that can be reused. The unit can also use disposable bags but this requires a bag adapter kit. 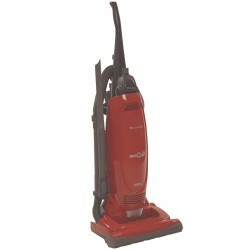 Consumers report that the vacuum has plenty of suction and they also like the lengthy 33 foot power cord. 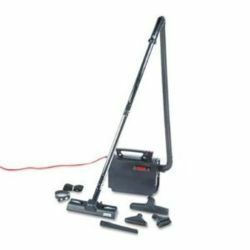 This vacuum is best for bare surfaces or low pile carpet. Read more about this vacuum in our Hoover CH30000 review. 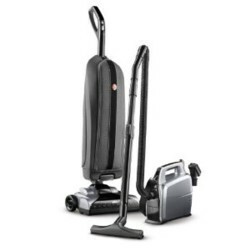 The Bissell Zing bagged canister vacuum 4122 gets good ratings from owners and is very inexpensive (around $50) – two factors that put it on this list. It is a straightforward machine with few features but it is lightweight, maneuverable, compact and easy to store. The vacuum nozzle also has a fairly low profile which allows it to get under furniture easily. It is best on bare surfaces but can also be used on low-pile carpet. As the machine is small the power cord is a bit short and the bags are on the small side. It is a good fit for an apartment or smaller home. 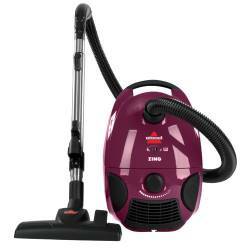 Read more about this vacuum in our Bissell Zing 4122 review. The MC UG471 excels at cleaning carpet and can usually be found between about $100 and $150 at most stores. The vacuum has strong suction and a range of tools. It also comes with a HEPA filter and is fairly quiet. In addition, the MC UG471 has one feature we don’t often see on an upright – a retractable power cord. This is popular with owners and works well. The nozzle has a floating base which acts, to some extent, as automatic height adjustment when moving between carpet and bare floors (or for different carpet heights). There is also a headlight on the front of the vacuum which helps when vacuuming in dimly lit areas. The power cord is a bit short and the vacuum is on the heavy side however. 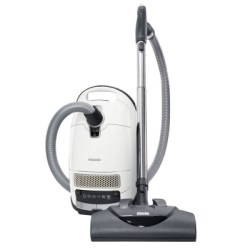 Read more about this vacuum in our Panasonic MC UG471 review. We first reviewed this vacuum back in 2009 and it is still on the market today and going strong. It also continues to make several of our “Top” vacuum lists including this one. It has a lengthy power cord, a lifetime LED headlight and is very good on carpet. The UH30010COM is lightweight (less than 12 lbs) and is easy to lift and maneuver. Bags on this machine are easy to remove and replace. In addition, it has HEPA filtration and comes with a supplementary canister vacuum that you can wear over your shoulder. The supplementary canister includes a shoulder strap and a 25 foot power cord. The UH30010COM does not have brushroll on/off controls however. Read more about this vacuum in our Hoover UH30010COM review. Is it more important for those with allergies and asthma to have a HEPA filter or a sealed system? I am looking at the bagged upright Miele U1Maverick, Obsidian Black. I wish it had both, and I see that I can upgrade the filter to a HEPA from the included Air Clean Filter. A vacuum will not earn a HEPA rating unless the motor is in a "sealed system"> A canister vacuum motor is "through flow". That means the suction air is pulled right through the motor and used to cool the motor along the way before being expelled out the exhaust. A "sealed system" means the motor is in a sealed housing and the exhaust can only exit housing through a filter opening. On older vacuums up through the 1980s the motor was sitting in the open body cavity and exhaust air went out through multiple openings unfiltered. HEPA is a filtration standard. The US Dept of Energy HEPA standard is a product of the Manhattan Project and nuclear industry designed to filter specific radioactive particles. It also happens to be the most demanding air filtration standard there is. Europe has several grades of HEPA, none of which are as demanding as the US standard, sometimes called "True HEPA". All kinds of vacuums have sealed systems with a HEPA rated exhaust filter. Sometimes people do not realize that filtered air can be diverted to cool circuit cards and cord winders so while air may be coming out of multiple parts of the vacuum body it is HEPA filtered air from a true sealed system. Kenmores are made this way, the new Titan T9000 and 9500 canister are. And while Mieles, Sebos and Lindhaus generally use sealed systems, depending on the particular exhaust filter you use you may or may not have full HEPA filtration, or it may be a less rigorous EU HEPA standard and not the tough US DoE HEPA standard. Miele makes a great vacuum. We have been a Miele family for over 10 years and swear by them. Even with 2 dogs in the house we have no problems with pet hair. Ours are made in Germany although I have heard that maybe some of them are now produced in China? Excellent overview. Thanks for the hard work. Looks like we will be getting a Miele. My wife just bought a Miele and I have been looking around to see if it was the right choice. Really glad to see that it is considered one of the best bagged vacuums out there. We got the Miele Capri which isn't on this list but apparently lots of the Miele machines are similar. Do you know if the Capri is also good? If you search for "Capri" on this site you will find a review. We updated the consumer ratings for this vacuum in October of 2017 and they averaged 93/100 which is very good. This is a well-liked vacuum, but make sure it has all the features you want or need.